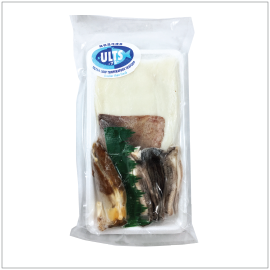 Freshly caught surume ika (cuttle fish) from Iwate Prefecture is packaged neatly into 4 divided parts: mantle, fin, tentacles & legs, and liver. Each surume ika is thoroughly cleaned prior to packaging and flash frozen at ultra-low temperature to retain its freshness. This item is great for sushi, sashimi, sautéed, fried or housemade Shiokara, a traditional Japanese specialty dish. Slice defrosted Surume Ika to bite-size portion. Combine Surume Ika Set with salt, sake and soy sauce. Pair this item with Sake from Iwate Prefecture for a Taste of Iwate.